Security screen doors, security porch enclosures and security gates, all custom made only in robust steel and wrought iron – Shieldguard specialise in providing maximum security, maintaining function, and all with a touch of architectural style. Our range of products and forty plus years experience in design and manufacture means you enjoy the advantage and peace of mind of a superior security barrier without sacrificing your property’s appeal. At Shieldguard we still manufacture our own products at our Melbourne based factory and showroom. No imported doors and no purchasing from large mass producing wholesalers. Each item is individually measured and made to order, allowing flexibility with our existing range or creating your own new and individual design ideas. Using our experience, you can be your own designer, we love the challenge! It’s real steel, it’s real craftsmanship. We hand forge, weld, fabricate and coat our products to look good and last. We use quality fittings and a range of coatings to protect your investment for years to come. 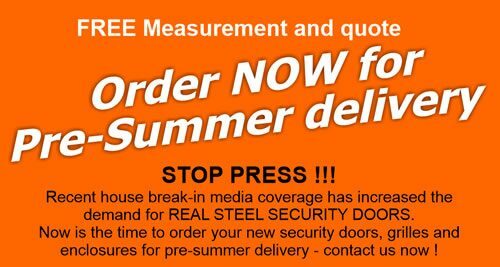 Let us measure, design, manufacture and install your new security requirements, we are known across Melbourne for our handmade security products and our strong after sales service.